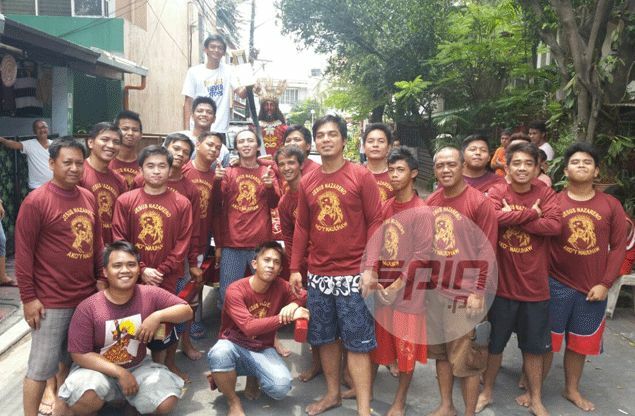 WHILE fellow PBA players are mostly out on the beach or to other prime vacation destinations, Barako Bull forward Ronnie Matias is busy leading a group of devotees for a Good Friday procession in Manila. Matias will be parading for the first time his six-foot Black Nazarene image which will be carried by around 20 devotees, including himself, around the neighborhood of the Holy Trinity Parish in Balic-Balic in Tondo, Manila. The former University of Manila stalwart has been a devotee of the Black Nazarene even before he made it to the PBA, having religiously attended the January 9 procession in Quiapo every year. The Lenten procession, he said, is just another way of paying homage to the Itim na Nazareno. “Marami akong utang na loob sa Itim na Nazareno. Bata pa lang ako madami na akong milagro mula sa kanya,” said Matias, who bared that playing in the PBA was one of the wishes granted by the holy image. Matias also shared a recent blessing he received from the Black Nazarene. “Nagre-rent lang kasi ako ng apartment eh. Sabi ko sa dasal ko na sana bago man lang ako mag-retire, maka-ipon ako ng pang-down (payment0 kahit sa maliit na bahay,” the 31-year old banger told Spin.ph. “Tapos milagro, mula GlobalPort, na-trade ako sa San Mig Coffee, tapos kaloob ng Diyos na nag-grand slam kami. Nakakuha ako ng kaunting pang down,” said Matias, who is now preparing to move in to his new house in Commonwealth before the end of the month. Matias’ wife, Jheda, is just as thankful for the blessings. “Sa Kanya (Black Nazarene) kasi kami dumaan para manalangin. At sobrang dami naming blessings na natatanggap,” she said. The Matiases will have a very busy Good Friday afternoon as they are set to walk with the rest of the devotees in Tondo, where the image has been housed since Sunday for the ‘Pabasa’. After the procession, Matias will also sponsor the ‘Caridad,’ a feast to feed the ‘debotong taga-buhat’ of the Black Nazarene.